We have all grown up hearing stories of the courageous Rajput kings and how their valour and glory was undefeated, haven’t we? As kids, we also fantasized about the forts and palaces that the kings lived in and the royalty they experienced. Visiting Jaipur makes us realise this dream for the first time. Hawa Mahal is just as synonymous to Jaipur as the Taj Mahal is to Agra. Any traveller or tourist visiting the capital city of Rajasthan must ensure a visit to the Hawa Mahal. Located in the heart of the city, Hawa Mahal annihilates the entire Badu Choupad and overlooks the Sirehyodi Bazar and the Johari Bazar. Its vast cover ensures that it escapes nobody’s eyes. Built in 1727 by Maharaja Sawai Jai Singh II, Jaipur is the core where many such tales and stories have emerged from. The capital city of Rajasthan, Jaipur is brimming with the grandiose forts, royal palaces and beguiling gardens that delineate this illustrious and imperial history of the city. Jaipur, although named after its founder, Maharaja Sawai Jai Singh II, was the first planned city of the country and was built by Vidhyadhar Bhattacharya as per the principles of the Shilpa Shastra. Rajasthan has been one of the biggest tourism contributors in India and most of this revenue has been derived from the capital city alone which is home to the majority of these magnificent forts. In the year 2017 alone, more than forty-seven million people visited the city to quench their thirst for travel and to experience the royal ways of the Indian subcontinent. Jaipur is popularly known as the ‘Pink City’ due to the city being majorly built out of pink and red sandstones which are found in abundance in the city giving the city a pink tinge, the colour of hospitality. Ruled over by the Kacchwaha clan of Rajput dynasty, who were in alliance with the Mughals for the biggest part of their rule, Jaipur monuments reflect the perfect and serene blend of the Rajputana and Mughal architecture. The blend is seamless and beautiful, unrecognizable but at the same time evidently different from each other, the most prominent example of this being the Hawa Mahal. Apart from the blend of Mughal and Rajputana architecture in the city, another harmonious blend that is evident is the one that can be witnessed as you saunter along the streets. This is the one between the history of the city filled with gallantry and the brilliance of modernity. Hawa Mahal is built out of pink and red sandstones and had its exterior walls further painted with calcium oxide in 1876, allowing it to have that additional pink tinge and therefore, adding to the reason Jaipur is known as the ‘Pink City’. As the name ‘Hawa Mahal’ literally translates to the ‘Palace of Wind’, the architecture of the palace essentially justifies the name it has been presented with. 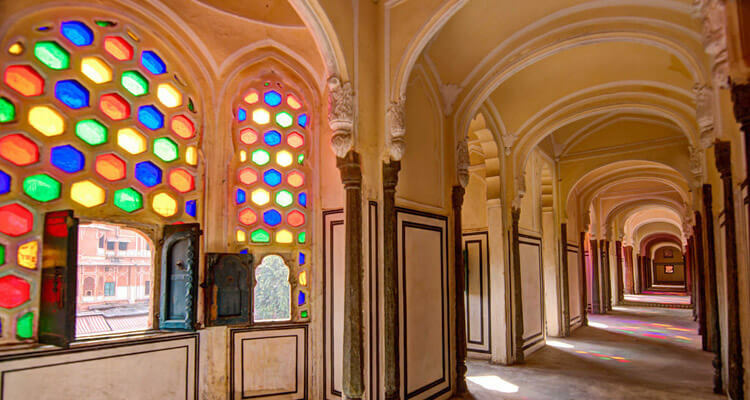 The entire palace consists of 953 windows or ‘jharokhas’ allowing the wind to pass throughout the structure and therefore creating the venturi effect, also known as the doctor breeze effect. The monument was, hence, air-conditioned even in the exceedingly hot summers of Rajasthan. For this reason, the palace eventually turned as an escape for the royal men and women allowing them to ponder over art, culture, heritage and many other things that the king enjoyed indulging in. 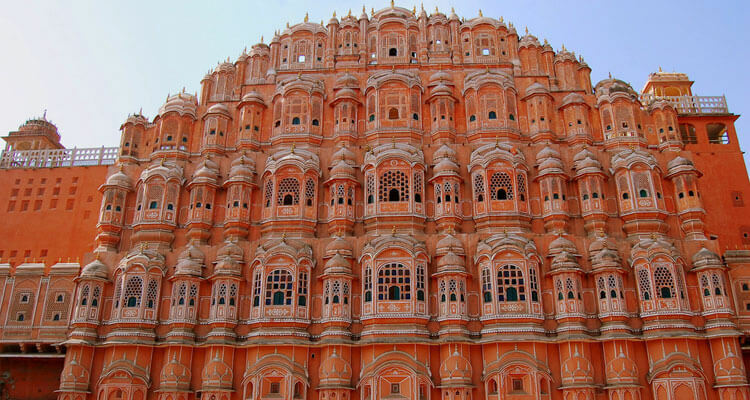 The best way to plan a visit to Hawa Mahal is with Jaipur city tour packages. The construction of the Hawa Mahal was facilitated by Maharaja Sawai Pratap Singh, the grandson of Maharaja Sawai Jai Singh II, the founder of the city of Jaipur. Throughout the rule of the Kachhwaha Rajput dynasty, only three rulers had been seen showcasing an interest in the development and advancement of the art, culture, architecture and the heritage of the society around them. Among these was Maharaja Sawai Pratap Singh. The construction of the fort finally concluded in 1799. The main architect of the palace was Lal Chand Ustad. Inspired by the Khetri Mahal built by Maharaja Bhopal Singh in Jhunjhunu, Maharaja Sawai Pratap Singh, an ardent advocate of architectural development, employed Lal Chand Ustad to commence the construction of the Hawa Mahal as an extension of the City Palace. Out of the innumerable reasons justifying the construction of Hawa Mahal or the ‘Palace of Wind’, two main reasons strive immeasurably beyond others. Both of them have logical backings however, instead of running in contrast to each other as different reasons most of the times, they have a complementary nature. The first reason is supported by the norms of the patriarchal society that the Indian society has been summoned under for the longest time known. It is said that the Hawa Mahal was built to enable the royal women to look at and enjoy the public processions and events without being seen by the public. The women could sit near the Jharokhas, which were small peepholes, and watch the everyday happening of the life outside the palace. This enabled them to enjoy a sense of freedom that they had so far been forbidden to, while still abiding by the laws and norms of the Purdah system. Another reason that has been awarded to the construction of the Hawa Mahal is in synchronisation with the literal translation of its name, in essence, the ‘Palace of Wind’. Due to the 953 Jharokhas that adorned the Hawa Mahal, the palace was air conditioned even in the extreme temperatures of the summer months. This was due to the creation of the Venturi effect, also known as the Doctor breeze. This provided an escape to the king and the royal women to enjoy their leisure time indulging in activities they wished to. This promoted their art and heritage immensely even if it was not outwardly visible. The Hawa Mahal is a five-storey monument with each storey housing a different side of the royal life. The five main structures inside the monument are: (a)Sharad Mandir (b) Ratan Mandir (c)Vichitra Mandir (d)Prakash Mandir and (e)Hawa Mandir. The Hawa Mahal is built in the shape of the tail of a peacock. This pyramid-shaped structure is adorned with 953 jharokhas each of them with intricate designs on them. The windows are covered in pink latticework. A further addition of the arched windows and hanging cornices produces a charming effect to the jharokhas. Built out of sandstone and covered in astonishing works and carvings of both Mughal, as evident from the arches and stone inlay filigree, and Rajputana culture palpable from the fluted pillars, floral designs, and domed canopies, Hawa Mahal is relatively simple on the inside. Yet its simplicity cannot be mistaken for blandness for the plain and stark interiors reflect the other side of one’s life. One that is in complete contrast to the royal life of the Maharaja and the royal women. The monument is structured in the shape of a beehive. This honeycomb pattern comes from the repetitive pattern of windows and domed pavilions that have been stacked together. However, this stacked pattern cannot be mistaken for arbitrary and random stacking, for the Hawa Mahal follows the concept of symmetry. This symmetry brings out the amazing architectural beauty of this monument. Another perception of the structure of Hawa Mahal or the ‘Palace of Wind’ can be viewing it in the form of Lord Krishna’s crown or Mukut. 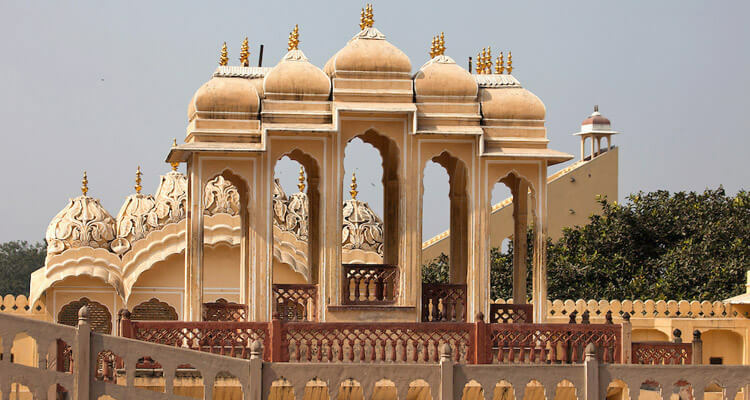 Maharaja Sawai Pratap Singh, the facilitator of Hawa Mahal was a great devotee of Lord Krishna and therefore, on multiple levels, has a temple dedicated to the Lord as well. As an extension to the Royal City Palace, Hawa Mahal can be accessed only through a gate known as Anand-Pol Gate in the Tripolia Bazar. This is the back door of the City Palace and therefore, as is evident, the Hawa Mahal has no front door entrance. Entering from the Anandpoli Gate, one comes across a wide and long courtyard. A fountain is placed in the center. Currently, an archaeological museum is positioned in the courtyard. The museum displays multiple artefacts including the paintings of the ancient era, the objects used by the royal men and women in their everyday lives and the weapons and armour used by the Maharajas in the times of war. The evolution of the weapons used, ranging from heavy swords and bows and arrows, as well as the way in which the royal family preferred to spend their leisure time, from painting and indulging in poetry to playing Polo, can be recognised and viewed here. The courtyard is surrounded by two-storied buildings on three sides and on the opposite end is the Chandra-Pol Gate. It is even before you enter the Sharad Mandir that you encounter the beautifully adorned gate that welcomes you inside. The gate, henna green in colour with golden embellishments, reflects the impact the alliance with the Mughal dynasty had on the architecture of the Kachhwaha Rajputs. Located on the first floor, Sharad Mandir was the concentre of autumn celebrations, as the name suggests. The word Sharad can be translated to autumn. Situated on the second floor, Ratan Mandir is the only area in the entire palace that has colourful glasswork. This is a form of embellishment that is most evident in the Mughal forts and palaces. The view from the jharokhas on this floor that are further covered with colourful glasses is beyond compare. The perfect royal life glimpse can be experienced here. Maharaja Sawai Pratap Singh was a great devotee of Lord Krishna and had, therefore, also shaped the monument in the shape of Lord Krishna’s crown. This floor of the Hawa Mahal was converted into a prayer hall that was devoted to Lord Krishna. This was Maharaja Sawai Pratap Singh’s personal praying area. Adorned with Araish work from the walls to the doors, this was the private area of Maharaja Sawai Pratap Singh. There were open terraces on both sides of the floor allowing an open space for the Maharaja to relax in. On the final floor of the Hawa Mahal is located the Hawa Mandir after which the entire monument has been named. There is a screen placed in the Hawa Mandir that faces east. In the middle of each of these chambers is a fountain. These clever placements of fountains and architectural tricks enhanced the cooling effect inside the palace. However, as is also evident, although Hawa Mahal literally translates to the ‘Palace of Wind’, there is no specific feature of the Hawa Mahal that suggests it to be a palace. And even though each of the floors are named ‘temple’ or ‘mandir’, Vichitra Mandir is the only floor which is essentially devoted to a god. One of the most prominent architectural features of the Hawa Mahal that one notices is the absence of stairs to reach the upper floors even though the entire palace is constituted of five storeys. As a substitution to the stairs, Lal Chand Ustad used slopes that connects the different levels of the structure. The purpose of installing slopes instead of the stairs was to facilitate the royal women with easier travel paths. Back in the days, the royal women wore Odhnis and Ghaghras, these were heavy clothes and were difficult to carry as well. The slopes were comparatively easier for women to walk on and commute to different levels as compared to the stairs that have been used in other structures. Another reason for installing slopes was to make it easier for the palanquins to be carried around the structure. A lot of royal women, especially the mother of the King and his wives preferred to be carried on palanquins instead of walking. These slopes provided more comfort to the women as the rides were now smoother. The Hawa Mahal is directly connected to the area that was restricted for the royal women, mistresses and the eunuchs of the royal household, in essence, the zenana dyodhi. The women could easily travel from the Royal City Palace to the Hawa Mahal without having to essentially move out of the palace and be seen in public, therefore, keeping up with the Purdah system. Another reason for making this connection between the two palaces was to make it easier for the Maharaja to move from the Hawa Mahal to the room of any of his queens without letting the others know. This allowed the discretion of Maharaja and maintained his privacy. Therefore, no one other than the Maharaja himself was aware of the room he was in. As can be seen, the Hawa Mahal does not house a lot of things for the regular travellers and tourists to do. The archaeological museum in the courtyard on the ground floor which can be accessed as soon as one enters the Hawa Mahal through the City Palace, displays the weapons and armour, objects of daily use and the clothes that were worn by the royal men and women in the past. The lifestyle today has changed significantly and it is fascinating to view the development of not only the clothes and objects that were used earlier in contrast to the ones that are used today, but also to notice the significant changes that are there in the architecture of the structures and monuments that were built in the past and the ones that are being built today. One of the most dynamic differences is between the influence of the local culture. While modernity today has created a common architectural pattern across the globe, the influence of the local culture in the ancient era led to the creation of multiple architectural patterns that were unique to the region. As these cultures came into contact with each other, newer patterns of architecture developed, as is significant from the engravings, arched roofs and the floral designs that adorn the walls of the Hawa Mahal. The primary reason Hawa Mahal is the most visited monument of Jaipur and why it counts as a ‘must’ in every traveller’s list is because of the fact that Hawa Mahal has a unique architecture to itself. Unlike any other, this was not a palace that was lived in by the royal family but was constructed for the leisure hours of the Maharaja. The most magnificent part of the Hawa Mahal is the rooftop. As one stands there and looks out into the wide horizon, they can view the entire city at once. The City Palace in the next courtyard and the glorious Amber Fort in the distance. The first renovation of the palace took place in the year 1876. The entire exterior walls of the palace were painted in calcium oxide that provided it with a brighter and a starker pink tinge. This added to the reason Jaipur is popularly known as the ‘Pink City’. An archaeological museum was opened inside the palace in the courtyard on the ground floor, allowing travellers to have a glimpse of the royal life. The artefacts range from their objects and weapons to their clothes and specimens of their documents and signatures of the Maharajas over time. Recently, the Government of Rajasthan, on the advice of the Archaeological Survey of India, added windows behind the jharokhas. 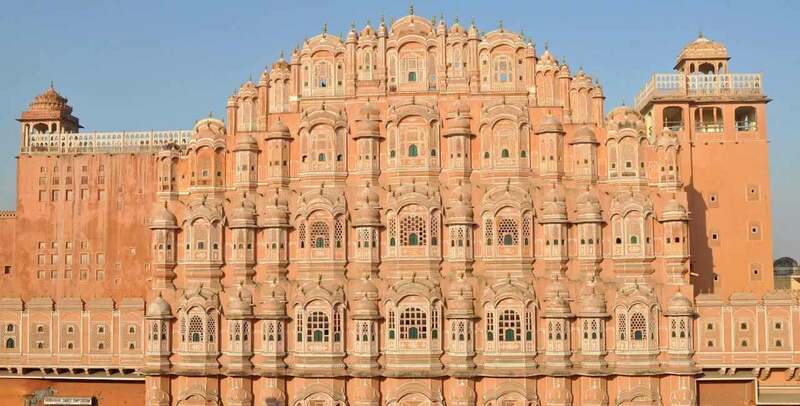 This addition was criticised as the wind could no longer pass throughout the structure and the Hawa Mahal could no longer remain the ‘Palace of Wind’. These windows also blocked the view that one could earlier get through these peepholes. This has majorly impacted the structure of the palace however, the Archaeological Survey of India provides the reason that it is essential for the preservation of the site since the constant construction in the developing areas nearby have an impact on the structure’s stability. Do not forget to checkout and book your 1 Day Jaipur Darshan Tour Packages from Jaipur Tourism. Jaipur is the capital city of Rajasthan and hence, is the most accessible location in the entire state. The tourism in the past few years has increased dramatically and therefore, the means of commuting not only to the city, but also within the city has been improved dramatically. Jaipur Tourism from Holidays DNA offers all-inclusive Jaipur tour packages with hotel, cab for sightseeing and meal plan included. The city is well connected with roads, train lines, and flight connections. One can take a road trip from the nearby city or state, e.g., Delhi, or choose the royal treatment and the leisure of trains and travel in the Palace on Wheels, the train that supports and fulfils all your royal desires. A more time-saving method of travelling is by flight, allowing you to save time and enjoy most of it by actually touring the city. 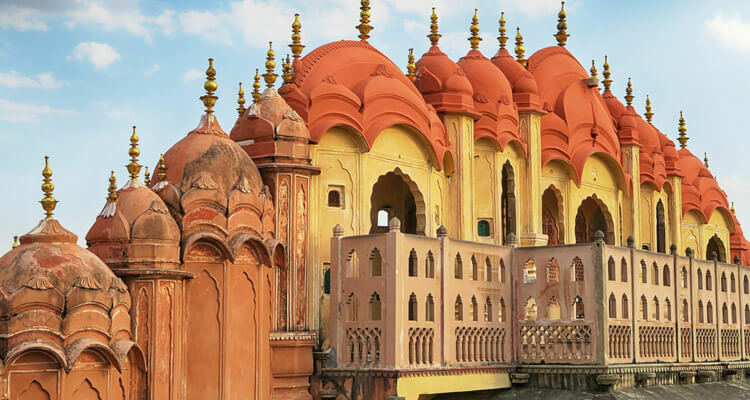 Once you are within the city, travelling to the Hawa Mahal is quite easy. Check out 3 best car rental companies in Jaipur, who offer comfortable and well maintained cabs for rent at most economical prices. Other options include simply taking the auto rickshaw, locally known as the tuk-tuk or if you are near the railway station, you can simply walk to the Hawa Mahal. Your mode of communication can depend upon your proximity to the monument. It is suggested that you cover both the Royal City Palace and the Hawa Mahal in the same day. Considering the fact that they are internally connected with each other, it is easier for you to travel between the two. 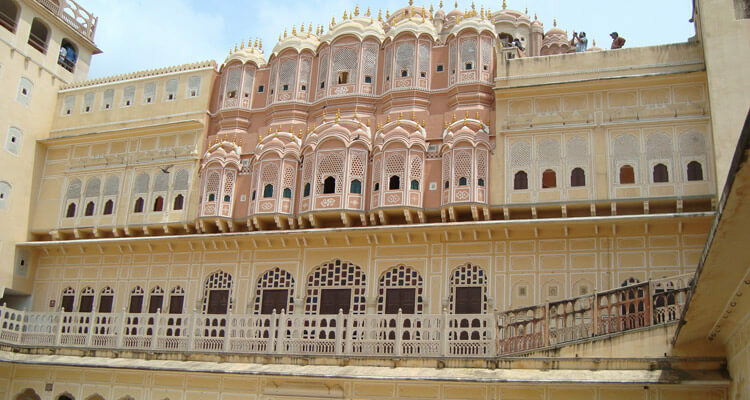 Hire a Jaipur local guide to show you around the Hawa Mahal or the ‘Palace of Wind’ to know better about the royal lifestyle and the detailed structure of the palace. 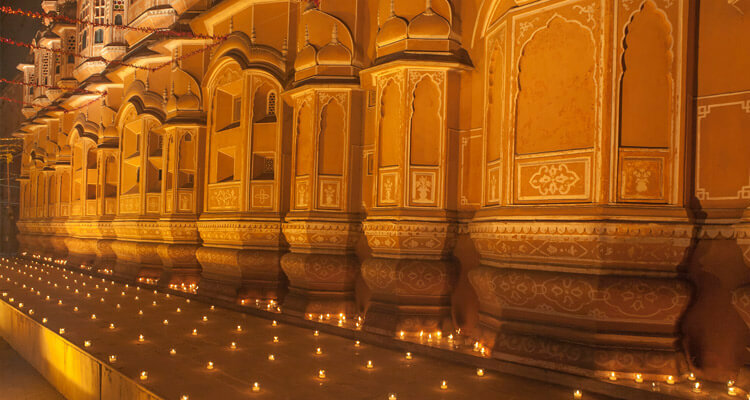 Also check these Jaipur local sightseeing tour packages from Jaipur Tourism. The Hawa Mahal, for the aforementioned reasons, is one of the most magnificent palaces of the royal capital of Rajasthan. It is a beautiful visual to behold and a seamless blend of the Rajputana and Mughal architecture. Not a palace in the truest sense, Hawa Mahal was earlier, a leisure space for the royal men and women and currently, the most visited tourist attraction of Jaipur. Hawa Mahal in Jaipur is open from 9 AM to 5 PM every day. It is open 7 days a week. During National / Public holidays the timings might vary. The entrance fee of Hawa Mahal is Rs. 50 per person for Indian nationals and Rs. 200 for foreign nationals.